St. Benedict is still the patron of Norcia – What's Up With Francis-Church? 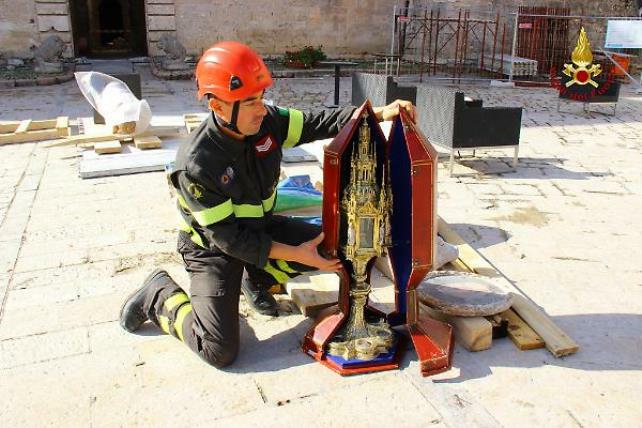 Saved by firefighters, the reliquary containing the relics of St. Benedict. …and the patron of Europe. Let’s not forget it. Finalmente, the e-address to make donations directly to the commune of Norcia for assistance to citizens and to help reconstruction. 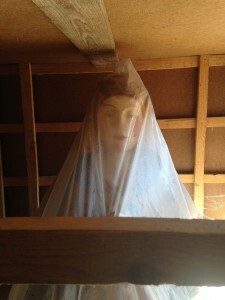 And more on the art being rescued from the Cittadella and the churches of Norcia. Good news comes at a difficult time. Thanks to the work of the Laboratory for Spoleto Cultural Heritage over 300 works were put safely in Norcia by the terrible shock of the last days. The news is the Board of Directors, composed of Pierre Marie Gruet, Pio Baldi, Vittoria Garibaldi. The handling operation took place following the shock of August 24, thanks to the work carried out with speed and professionalism in early October. In this way at the time of the collapse of the Santa Rita church of Norcia, on October 30, inside the building they were no longer the works of art that had been hospitalized after the earthquake of 1997, pending the possibility to return them to their places of origin (Preci, Norcia, Cascia).